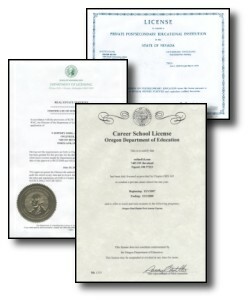 OnlineEd, Inc. is a state-licensed real estate school and insurance school based in Portland, Oregon and has been offering courses over the Internet since 1998. All of our teaching and instruction is done via the Internet and through our unique course management system. We do not retail or repackage courses created by other vendors. We actually write and publish our own course material for an exclusive online experience. You won't find the courses offered by OnlineEd anywhere else on the web! All course materials are written by knowledgeable, experienced industry professionals and instructors. OnlineEd has been an approved NMLS course provider of continuing education since 2009 (NMLS #1400327). Our mortgage continuing education classes have been sold nationwide every year since. Administrative office hours are 9:00 AM to 5:00 PM Pacific Time, Monday through Friday. After-hours sales and support is often available.